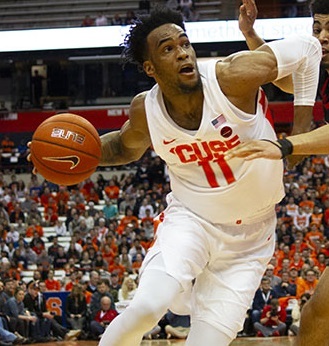 Oshae Brissett is a forward for the Syracuse Orange basketball team. He was the 2017 Biosteel All-Canadian High School Player of the Year. Brissett showed early in his freshman season that he had a good nose for getting rebounds and driving to the hoop. He would finish his freshman year with fourteen games where he had ten or more rebounds. Brissett showed he was good at spotting up for the open three point shot, and particularly good at drawing fouls when he tried to score. He would lead the ACC conference in free throw attempts. Against Buffalo, Brissett would go 16-16 from the free throw line. He would lead the team in scoring in the NCAA tournament with 68 points in the team's four games. He would earn a place on the All ACC Freshman team. Brissett would struggle his sophomore year to match the production he had as a sophomore. He was not as aggressive rebounding, and his shooting digressed, particularly from three point range. He also would be fouled far less, and his free throw shooting percentage dropped significantly.